Our teaching and learning centre offers both a Spring and Fall faculty orientation to teaching which is pitched at faculty new to Vancouver Island University (VIU). 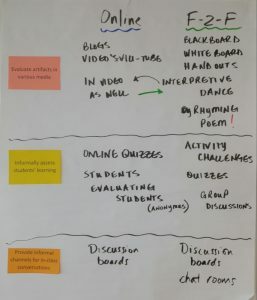 The purpose of this event is to introduce faculty to teaching and learning resources for designing learning experiences, engage them in conversations on best practices for fostering critical thinking in students, and provide an opportunity to meet and work with other colleagues from other disciplines. This is a full day event and includes sessions on: fostering student motivation and in-class engagement; designing classroom activities that challenge students to think critically; using technologies for teaching to enhance student learning; assessing and evaluating learning effectively; understanding the cultural and intellectual diversity in your classroom; and interacting with new colleagues on the culture of teaching and learning at VIU. The ambitious and diverse program requires a collaboration by all of our centre’s staff, including our Curriculum, Teaching and Learning Specialists, Director, Learning Technologies Team, and support staff. This is one of my favourite aspects of the program as we get to collectively define and design the program and each team member has a chance to design activities for the day. The sessions are highly interactive as well, so our participants end up contributing significantly to the discourse and program in meaningful ways. Our learning technologies team has traditionally struggled to find a way to best share the range of educational technology tools, design possibilities, and support available within a short session during the day. Our centre supports a variety of software which may be used to support web-enhanced, blended, and fully online courses. We have felt that simply showing all of the tools available overwhelming and focusing in on just the more commonly used ones can be limiting. Additionally, faculty come with a range of experience, interest, and understanding of educational technologies, making an overview session a challenge. 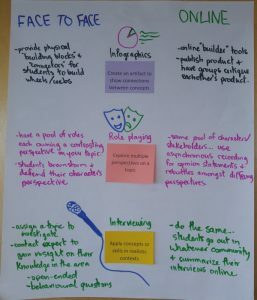 Analyze or synthesize readings, events, guest presenters, etc. 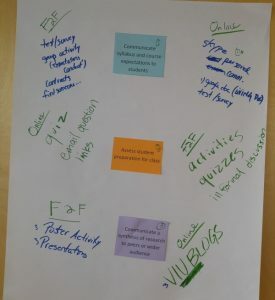 The groups were tasked with coming up with ways in that activity could be enacted either in the classroom or online. 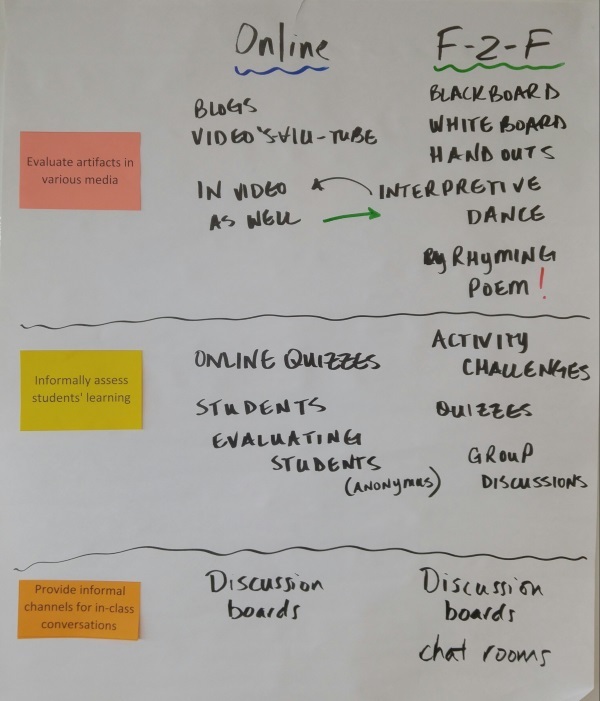 We challenged faculty to consider the differences in how they would approach designing the activity based on the mode in which it was conducted and consider which activities might be better suited to face-to-face or online delivery. The ideas were then shared with the larger group exposing multiple perspectives on design for both face-to-face and online. We are fortunate at VIU as both a residential university with small class sizes. So there is great potential in running interactive and engaging sessions with students in the classroom. Engaging students online is optional for faculty but increasingly becoming commonplace. 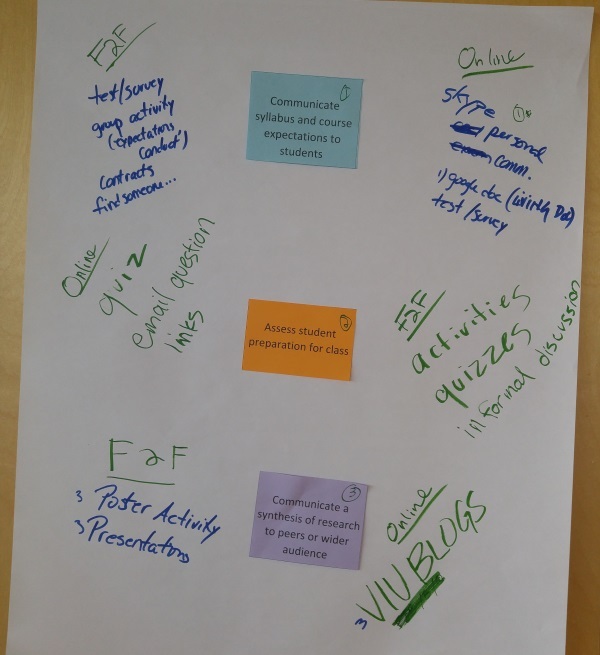 Our hope from this activity is that faculty might consider how they might conduct some of the activities they want to engage students with online, and how that might further enhance their time with students in the classroom. 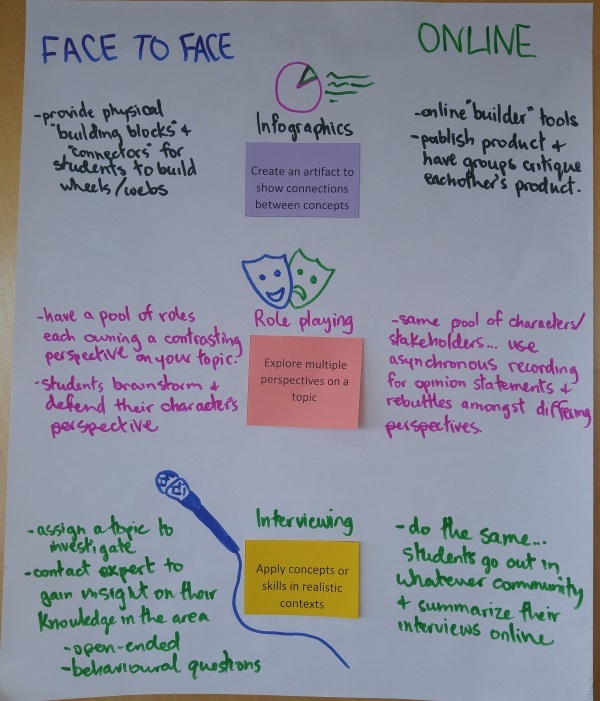 I am happy to share the handout we provided to faculty with some of our own ideas of mapping educational activities to face-to-face and online. I am hoping to grow this document so please feel free to leave a comment if you have ideas on how it might be improved. Engaging New Faculty with Educational Technologies by Michael Paskevicius is licensed under a Creative Commons Attribution 4.0 International License.